Mick St. John (played by Alex O'Loughlin) is a private investigator based in Los Angeles - possibly not the wisest of choices when you're also a vampire. Mick is a somewhat reluctant vampire, shunning fresh blood in favour of blood from the blood bank. His speed, strength and senses are useful in his chosen career. As a relatively young vampire, (a mere 85 years old), he relies on one of his closest friends, the 400 year old vampire Joseph (Jordan Belfi). Many years ago, Mick accepted a case involving a child kidnapping. Tracking down the child, he discovered that the kidnapper was his beautiful ex-wife, Coraline, and the woman who turned him into a vampire on their wedding night. As he rescues the child, he kills Coraline by trapping her in a fire. Over the years, Mick kept a protective eye on the young child from the shadows, but one day their paths cross at a crime scene. Beth Turner is there in her capacity as an investigate journalist, and there is an immediate connection between the two. As their relationship develops, Mick struggles with revealing the dark side of his nature to Beth. Later in the series, Mick's past resurfaces and threatens both him and his fledgling relationship with Beth. Moonlight follows Mick as he rediscovers his human side, all the while combining action, mystery and a good dose of romance. The series is an interesting addition to the vampire genre. Clever writing, good action scenes, camerawork and interesting lead characters lift this series above the norm. It's a pity that it looks like there won't be a second series - it would have been interesting to see how the story developed. Console yourself with all 16 episodes of the first series on this boxset. 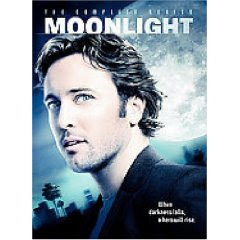 I love Moonlight and I am happy to at least have the DVD with the 16 fantastic episodes that were filmed before this wonderful show was taken off the air. I still miss it so much, but all of Alex O'Loughlin's work is outstanding - to say the least - so I am happy that Three Rivers has been picked up for this fall. I am also looking forward to Alex's new movies, WhiteOut and The Back-Up Plan. If you don't have this DVD already, BUY IT! While you are shopping be sure to pick up all of Alex's other work on DVD - TV and movies. The man can do no wrong on film!